Greeted by another bright, sunny Wellingborough morning, the penultimate Anglian League game of the season took place in the grounds of Harrowden Hall against Cambridgeshire. Having practised on Saturday afternoon, we knew the course was softer than the last league match at home and from County Champs, but more importantly due to a major scarification project on the greens, carried out the previous Monday meant the greens would be a challenge throughout the matches – obviously putting would be difficult, but it transpired that controlling pitches and chip shots would be equally difficult. Having selected the team late in the week leading up to the game, due to the English Amateur Champs and expected England Boys International call ups, the team featured 5 changes from the July match, with Callum Farr, Tom Forster, Ben Jones, Lee Hitchcock and Robin Williams all unavailable. In years gone by, missing talent and ability of this quality would have left a Northamptonshire side short, but adding Lewis White, Michael Farr, Charlie Salter, Ryan Connolly and county debutant Tom Bullough to the ever presents Fraser Carnihan, Mikey Chambers and the reliable Miles Mudge meant that we started the matches in confident mood. Leading the side out in the foursomes matches were Mikey Chambers and Fraser Carnihan, a partnership that has grown throughout the season. 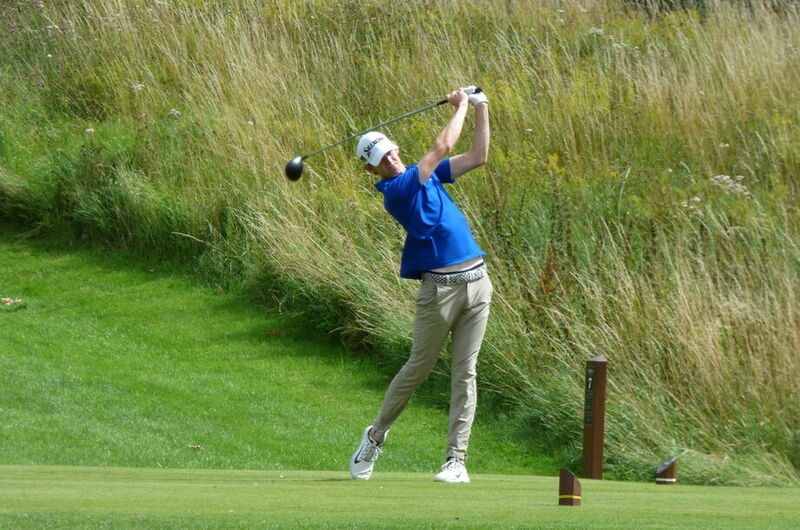 On this occasion the early part of the round proved costly for our boys, losing three of the first 6 holes, due to mix of our mistakes and Cambridgeshire consistency. Mikey and Fraser would fall a further hole behind around the turn. To their credit and proving their very similar never give up attitudes, a couple of holes pulled back led to the pair going up 17 with the chance of securing a half. However, we all know how difficult it is to make birdie at the 17th at Wellingborough and with a secure par the Cambridgeshire pair won the match with a 2&1 victory. In match 2 Charlie Salter and Miles Mudge teamed up for their first foursomes game together. Right from the start, the Northants lads hit their stride and opened up a 3 hole advantage in the first half dozen holes, extending this to 4 up at the end of the front 9. 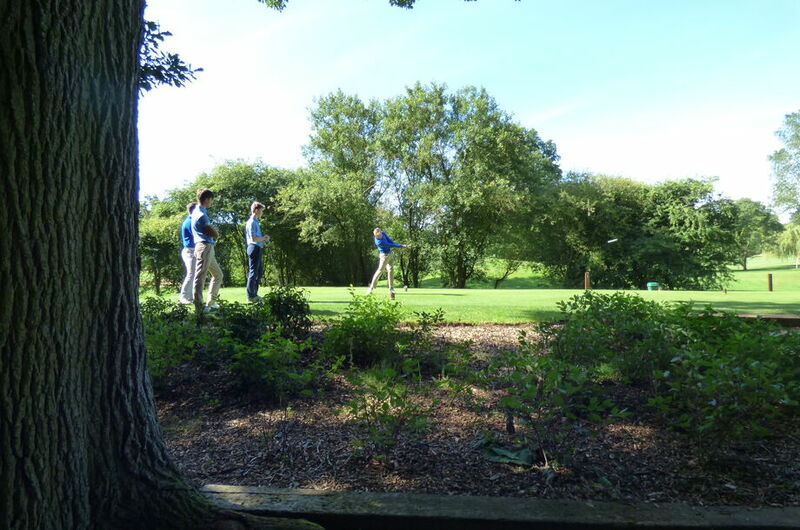 The quality of golf played by Miles and Charlie gave their opponents no chances to get back into the match and with a further hole gained for our lads, a 5&4 victory came very quickly, just over 2 hours of the first shot being struck. 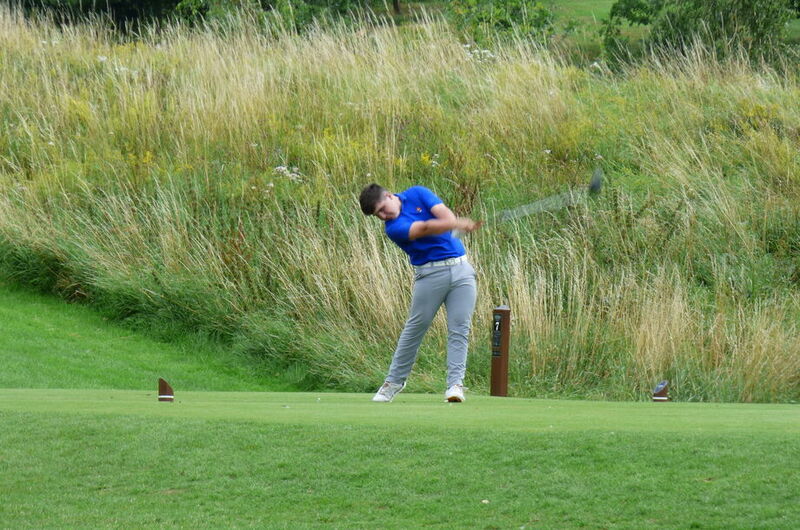 Match 4 of the foursomes set was Ryan Connolly and Lewis White. While perhaps not finding their own top gear during the match, Ryan and Lewis’ ball striking was plenty good enough for their opponents, despite being down through 6 holes. The Northants pair overturned this by winning both 7 and 8 and never looked back. Extending this lead quickly through the early back 9 to 4 up after 14 holes, this lead was never going to be turned and the boys shook hands in the 15th green. Back to match 3! The 18th is a short hole that creates drama at every opportunity! After both finding the centre of the fairway with the positional tee shots, the Northants pair had an awkward, downhill, ball below the feet, 90 yard shot to the back left hole location. With the Cambridgeshire ball just 5 yards further forward and further right, all we needed was to match their score to win the point. For those of you that don't know Tom, know he is a tall man, making this particular shot more awkward. Unfortunately, the shot would be slightly thin and flew threw and over the green, over the wall and out of bounds beyond the green. Cue obvious disappointment from both players and those assembled watching, as this was the only match remaining on the course. Michael Farr then offered the Cambridgeshire pair to play their second shot, while he sorted out a ball, ready to play our 4th shot. This may have been an excellent move – with the now obvious danger lurking beyond the green, knowing that a 4 was probably going to be good enough to get a half from their match, the Cambridgeshire shot didn’t make it on to the top tier, in fact only just made it onto the green at the front leaving a very long, steeply uphill putt. It was now Michael’s turn to play the awkward 95 yard shot, knowing that maybe, just maybe a 5 could get a half from the hole and a win in the match. His wedge was an excellent one, high and hanging in the wind, at one point looking like it may be slightly long, but it was excellently judged, coming up 8 feet left and just short of pin high. Cambridgeshire’s first putt up the slope came up short and crucially just outside of our ball, leaving them with a putt to win the hole. As had been proved all morning, it was these putts that were the most difficult to hole and the visiting pairs putt just moved across the hole and stayed out. This left Tom a chance to atone….one which he took confidently and with a huge sigh of relief and possibly slightly embarrassed look on his face, the pair shook hands on a 1 up victory. The determination shown in this match particularly, proves what an excellent group of players we have in our county and most importantly their will to succeed and not give away cheap points – it’s obviously impossible to measure what difference going in at lunch leading 3-1 as opposed to 2.5-1.5, but my feeling is that this final hole performance was the catalyst to what happened in the afternoon singles. After a leisurely lunch, thanks to the excellent pace of play in the morning matches the singles were ready to begin just after 1pm. With just 3.5 points required from the 8 singles matches to ensure a victory, this year’s County Champion (at Wellingborough) Charlie Salter led the team out, followed by Mikey Chambers, Lewis White and Fraser Carnihan. Backed up by Tom Bullough, Michael Farr, Ryan Connolly and Miles Mudge. Feeling confident about our position the Captain was naturally cautious as this was the exact position we had been in two months earlier in our match against Lincolnshire, which we would go on to lose by 1 point. However, the players were in no mood to let this happen again and the quality of golf played by the Northants lads this afternoon was hugely impressive. Having seen the team out from the first, Captain and Team Manager made their way down to the back of the 6th green and while obviously the matches become quite strung out, all 8 matches through the 6th were at least 2 holes up, with 5 of the team being 3 up! Indeed Charlie’s match was complete, with a 6&4 victory before Miles had reached the 8th green! A fantastic performance by Charlie, one which he had promised and delivered! In matches 2 and 3, Mikey and Lewis were always in charge of their matches, 3 up and 5 up through 12 holes. Both playing very solid, if not excellent golf. From these positions you can control the outcome of matchplay games at Wellingborough and both players would close their matches soon after, Mikey on 16 with a 3&2 win and Lewis 2 holes earlier, 5&4. So 3 wins to add to our 3 morning points, we had guaranteed at least a half. Fraser had also got to 5 up with 5 holes to play. 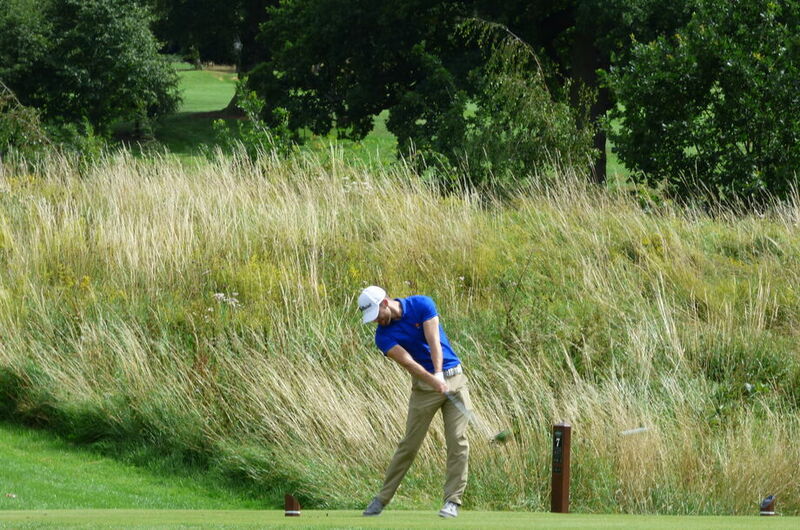 A Cambridgeshire birdie on 14, followed by a dropped shot on 15 meant Fraser had to carry on. Another opposition birdie on 16, pushed Fraser up the long 17th. As we said earlier, birdies on 17 are rare and with 2 good long approach shots, Fraser was left with a 4 footer to win his match. Though admitting afterwards, the 4 footer was not as simple as it should have been, to his credit he knocked it in and shook hands on a much tighter victory than had been deserved. Confirming the overall match win! 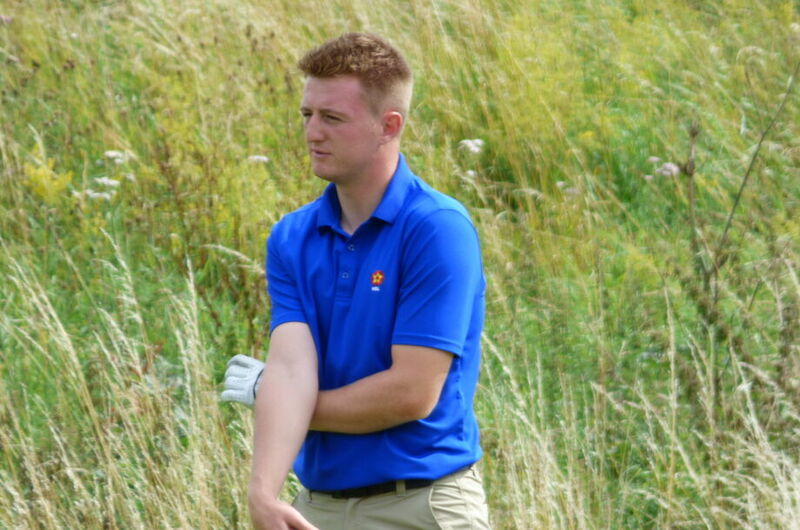 In match 5, rookie, Tom Bullough was again proving that steady and consistent golf, was the order of the day and handling the green surfaces with patience! 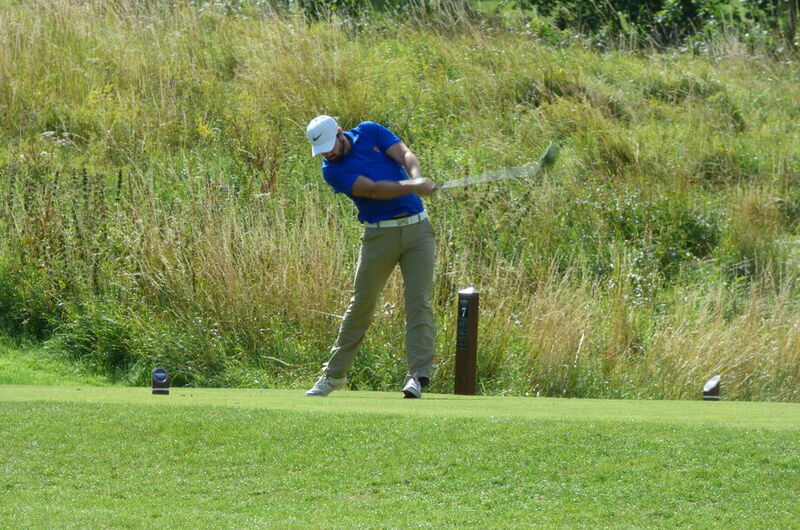 His opponent and Cambs captain could not find a way back into the match, needing birdies to gain holes back, he could not hole the putts required and hands shook on the 15th green, with a 4&3 win. Tom’s county debut resulting in 2 wins – congratulations Tom! Matches 6 & 7 in the meantime had become tighter over the course of the middle of the round. Both players were 1 up walking off the 11th green. Michael maintained this advantage all the way, again, to the final hole. 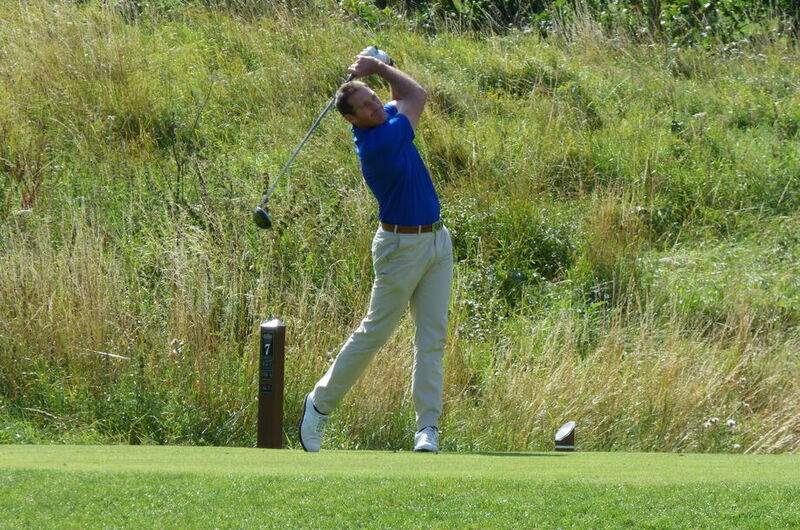 With the honour on the tee, Michael’s iron shot again found the centre of the fairway, with about 95 yards to play. His opponent, needing to win the final hole to gain a half, took the bold decision to take on the green! His tee shot, excellently struck would eventually find its way to the back right corner of the green, with a chip shot of about 50 feet across the green. A seriously excellent tee shot. Knowing that a 3 would likely be required to win his match, Michael took his time, firstly to make sure he knew his opponent’s ball was safe and where it was. After some deliberation over club selection, taking his time to check his yardages, Michael again played an excellent wedge shot to about 15 feet just short and left of the flag. His opponents chip shot came out of a nice lie, but it was one of those chips mentioned earlier which seemed to land softly on the scarified green and stayed short by about 8 feet. Michael’s putt missed on the left handside of the hole, but secured a par. Leaving his opponent a right to left breaking putt. A putt that would not fall, despite looking good for much of the roll. So another win and point on the board. Credit should be given to Michael, for the time he took on the 18th – I’m not normally an advocate for slow play, but on this occasion, given the adrenaline his opponent would have felt hitting such a world class tee shot, the time taken seemed to let that adrenaline disappear and the opportunity for win the hole passed up. By this point Miles Mudge had won his match, again on the 15th green with a 4&3 victory. Another example of getting up early and controlling the match, not with a run of birdies, but with control, assured touch on and around the green. Mudgie was delighted to win his first singles point of the season and is credit to his own determination, desire and ability. Very few players work harder or care more about the game and his county than Miles and he is an absolute pleasure to captain. 7 wins from 7! 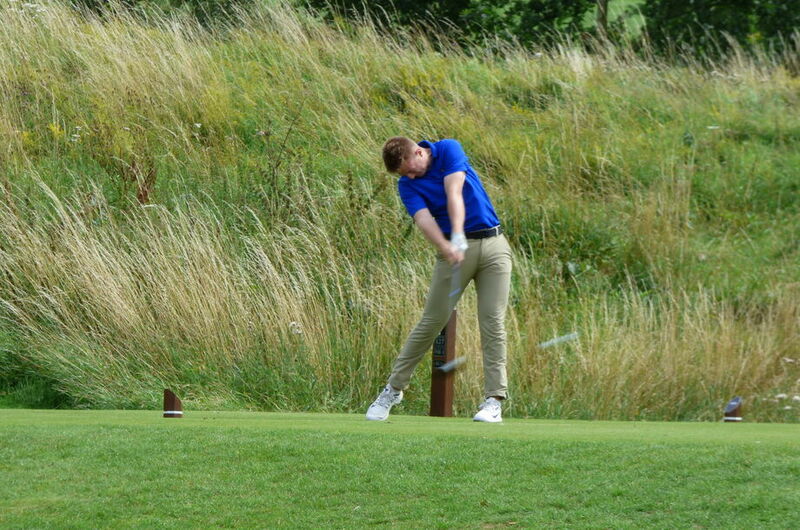 This left Ryan out on course in his match against the promising Cambridgeshire youngster Ollie Rust. Having again got 3 up through 6 holes, this match was probably the one on the course that was full of quality with numerous birdies traded and both players playing excellent golf. 3 up through 6 had slipped to 1 up through 11, which would become 1 up through 15. When they reached the 18th tee, the match was all square. Again both players found the fairway, with Ryan some 40 yards behind. An excellent approach left him with a 20 footer from pin high right, the putt on a similar line we had just seen missed by Michael’s opponent. Ollie played a decent wedge shot in, to just under the hole and just inside the distance of Ryan’s. As had become a theme on the day, neither player could find a way of holing their putt, so the players shook hands on a half and complimented each other on an excellent game. Ryan was naturally disappointed not to get a win, but his game seems to be in good shape and you can’t win them all! In my many years involved in County Golf, I don’t recall us winning a match by such a margin as 10.5 – 1.5. The 2011 home match against Cambridgeshire was won 10-2, coincidentally, the last time we won the Anglian League….. 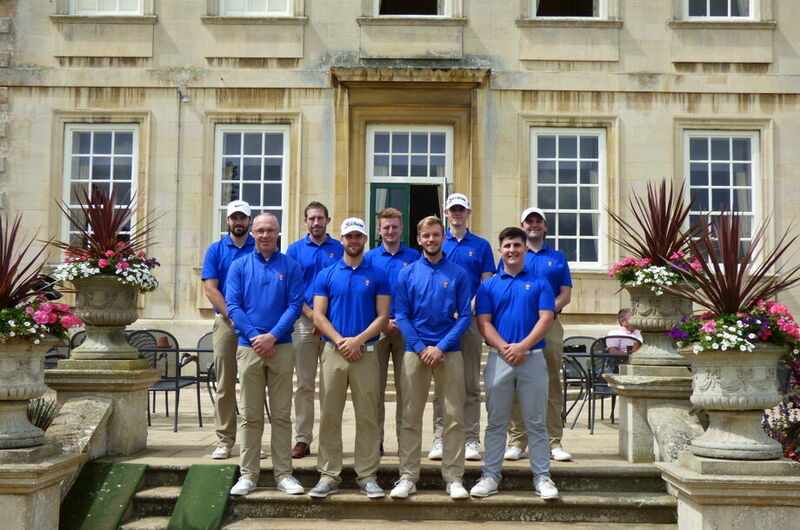 The Northamptonshire players performed admirably, with high quality golf and an adaptability and attitude to cope better with the complex greens. They should be very proud of this win, if for no other reason than we knew a win would give us a chance to go into the last fixture of the season with a shot at the league. Not every team can handle that type of pressure and I think it shows what we have created as a group this year. A truly excellent and enjoyable weekend and a wonderful team to Captain! My thanks to Team Manager Mike Gilbrook to all he does, much of which unnoticed. Shane Rose for his preparation and practise day expertise. And of course to Wellingborough Golf Club – a venue that impresses all our visitors and one that is beginning to suit our players. 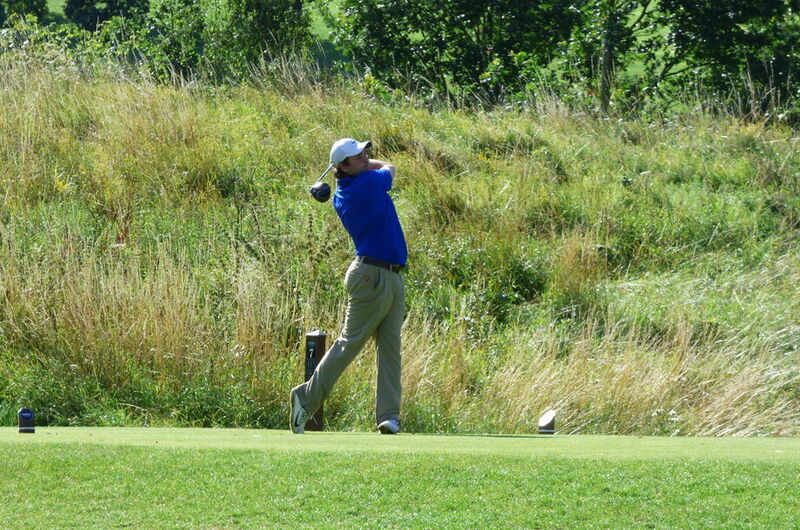 The final match of the season is played at Glen Gorse Golf Club on September 3rd, versus Leicestershire. Any and every bit of support on the 3rd would be very much welcomed and appreciated.